Foot Locker is the world's largest athletic specialty store retailer, offering a broad selection of footwear and apparel to meet today's ever-changing needs. 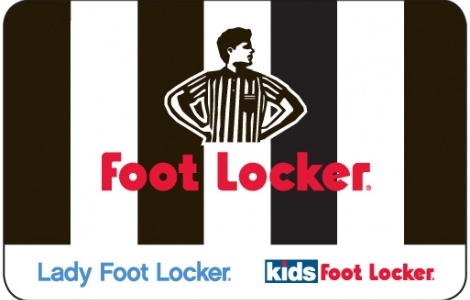 Whether it is function or fashion, Foot Locker, Lady Foot Locker, and Kids Foot Locker have what everyone is looking for! The Foot Locker Gift Card is redeemable for the latest in athletic footwear and apparel at over 2,000 Foot Locker, Lady Foot Locker and Kids Foot Locker stores in the U.S. and Canada. For the Foot Locker store location nearest you go to our Dealer Locator on the website. You can access all Foot Locker locations. Foot Locker Gift Cards are also redeemable through our catalogs and online. National Gift Card is the best place for you to order Foot Locker gift cards in bulk. We are the experts in all things gift cards and can set up your gift card solutions program for you today. Please contact us for more information on Foot Locker bulk, direct-to-recipient, or individual gift card fulfillment for your gift card program. Contact us here or call us at 888-472-8747 today! The merchants listed are not affiliated with the program, the program sponsor, or the program administrator, nor are they sponsors or co-sponsors of the program. All merchant names, logos, trademarks or other marks herein are used with permission. The registered owners of the names, logos, trademarks or other marks retain all rights therein. Merchants may have additional terms and conditions, which may be found on the gift card, gift certificate, voucher, or merchant’s website. Merchants listed are subject to change without notice.